So many of my readers are just happy to know how to take care of their plants, to just keep them alive. However, after we learn how to be successful in taking care of our plants maybe it is time for the next step. Propagation is perhaps the most exciting procedures for increasing your plant family. It’s simple and satisfying to create offspring from favorite plants. Try it! You have nothing to lose because you still have your original plant. Any time of the year is a good time to take stock of our houseplants. Some could be looking a little weary, so maybe it’s a good idea to make new plantlets from stem cuttings. The technique is so easy and you will gain even more pleasure from your plants by seeing them grow from the very start. 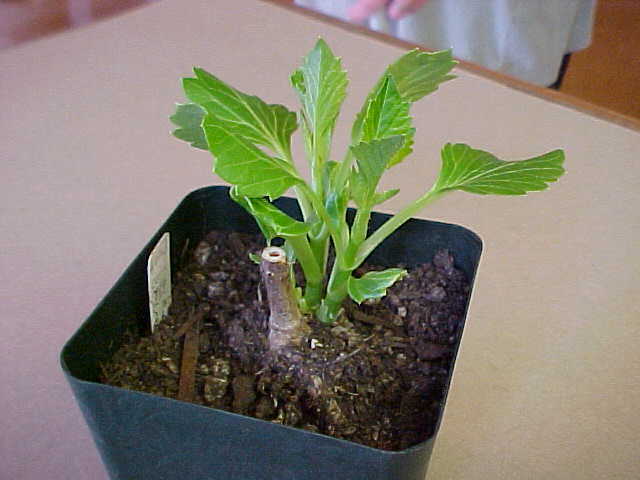 Many houseplants can be propagated from softwood cuttings taken in March and April. Many of the shrubby plants root from semi-ripe cuttings taken later in the year. The method of taking softwood cuttings is similar to that of semi-ripes but choose the ends of new shoots. Take softwood cuttings after the first flush of spring, but before the shoots have become hard. Follow the same procedure as for semi-ripes as follows. Suitable plants for propagation are pelargoniums (geraniums); coleus and impatiens can often be rooted in water. Fill a jar almost to the top with water and fold a piece of wire-netting (chicken wire) over the top. Make the cutting 10-15 cm/4-6 in length choosing the current season’s growth after the first flush of growth, but before the whole shoot has hardened. Fill a pot with a medium compost or use a seed compost and firm it to remove any pockets of air. Trim the cutting just below a leaf joint, using a sharp knife, removing the lower leaves to produce a clear stem to insert into the compost. Dip the end of the cutting into a rooting hormone. If using a powder, moisten the end in water first so that it adheres. Make a hole in the compost with a small dibber and insert the cutting so that the bottom leaves are just above the compost. Firm the surface around the stem to remove air pockets. You can usually insert several cuttings around the edge of the pot. Water the cuttings, then label and cover the pot with a clear plastic bag, making sure that it doesn’t touch the leaves. Keep in a light place – but out of direct sunlight. If a lot of condensation forms, reverse the bag or ventilate the propagator if using one. Do not allow the compost to dry out. Pot up the cuttings once they have formed a good root system. Numerous plants such as tradescantias, impatiens, pelargoniums will root easily even without help from a rooting hormone. Happy Propagating!